A great day in Omaha. About five inches of snow on the ground this morning and cold! But the sun came out and cleared the streets (with the help of amazing road crews). 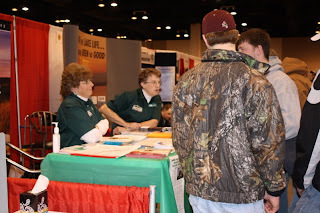 The crowds at the show were big, and interested in what there is to do in Nebraska. Even though we had to convince one person that SAC is NOT in western Nebraska! Lora from Norfolk is busy letting people know about the Johnny Carson Comedy Festival. 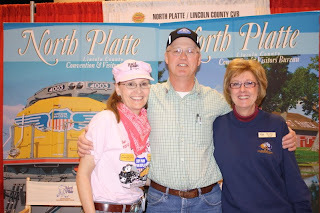 The ladies from the Sandhills Journey Scenic Byway were kept hopping all day telling people about Nebraska's Highway 2. I'm not sure Terri ever got her voice back! 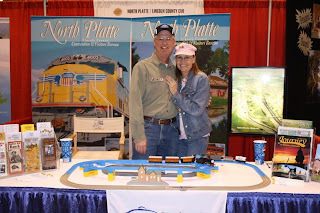 OK, by now I'm sure you're all wondering if we (meaning I) EVER stay in my booth to tell people about North Platte. The answer is YES, I do. After playing Thomas the Tank Engine engineers all day, we have decided that Foamers start out as Droolers. That is not meant in a disparaging way by any means. 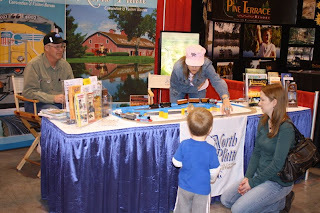 We love Rail Fans of all ages, but little boys from before they can walk can't get enough of Trains. Yes, we were even in the booth together on occasion, and for a few brief moments had time to pose for a picture. The start of a new day and time to replace the batteries in all the trains. Yeah, Mark has a real tough job! 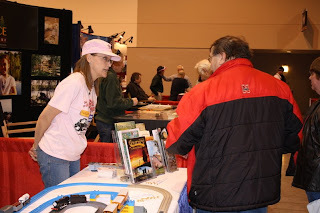 Actually, he's our "go-to" guy for all Railroad questions. 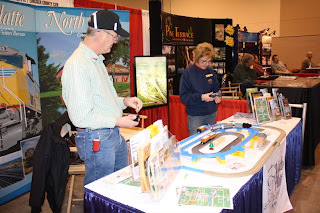 Kudos for his willingness to give his time to promoting Rail Town USA. And thanks to Kathy from the Golden Spike Tower and the Chamber for relieving us. Now, it's time for some R & R, maybe a pint of Guinness, friends and Irish music back at the Dubliner. and we are in the low 60's here, guess this wasn't a Pacific storm or I would have seen it a day before you saw it. 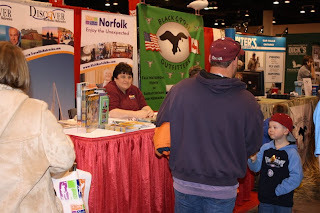 This booth was for the tourism council I imagine..
Capt Johnathan really is expected in the TB chatroom Mon night,, those rooms really post fast and I have to concentrate on the conversation or it is gone... you canno tab browse it casually in my case I do want to "look in"